There are many churches and cathedrals in the old city of Nice in Provence, France but the Cathedrale Sainte Reparate is one of the most historic and has a very interesting story behind the name. The Cathedrale Sainte Reparate was built in the 17th century to honour the young martyr from Palestine whose body was washed onto the shore of Nice many centuries earlier. 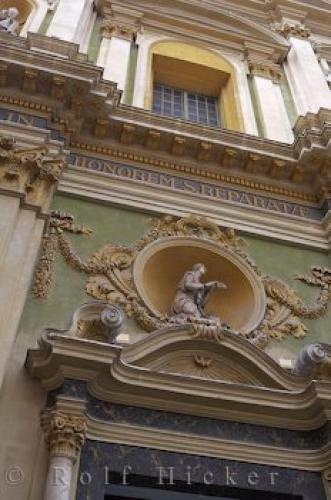 Only 15 years old, the boy became the patron saint of Nice and received the name Sainte Reparate. The Cathedrale Sainte Reparate is located in the Place Rossetti, the central square of Old Town in Nice, Provence and the 18th century bell tower can be seen and heard from afar. The exterior is impressive with many columns and ornamental carvings, plus a dome of ceramic tile. in Nice, Provence in France, Europe. Cathedrale Sainte Reparate, Built in 1650, Old Town, Nice, Provence, Cote d'Azur, France, Europe. I photographed this photo with the digital SLR camera model Canon EOS-1Ds Mark II, aperture of f/6.3, exposure time of 1/50 sec. on ISO 100, as always I used a original Canon Lens, the focus lenght for this picture was 42mm.